We reviewed the Actyon in the February edition and were disappointed with many areas of the performance, on and off road, and tray load carrying. Now with the latest model due to be released, it was time for a reassessment. I have a healthy respect for Korean carmakers. Hyundai and part-owned subsidiary Kia have gone mainstream in just a few years and, in fact, are market leaders in many areas. Daewoo, now 100 percent owned by GM, produces class-leading vehicles we see badged today as Holdens. 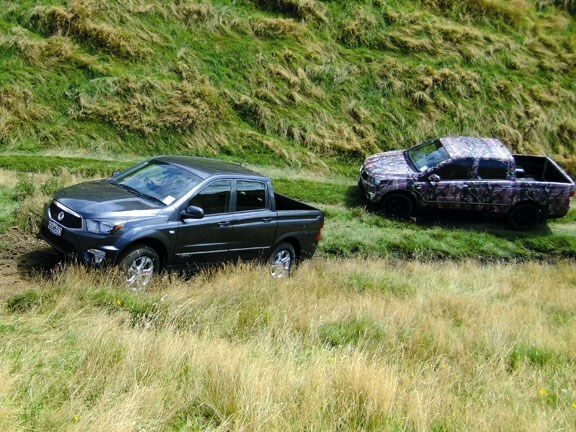 So when the fourth Korean, SsangYong, says it has an updated model to release to the New Zealand market, it has both a huge reputation to upkeep and has to front up to cutting-edge vehicles, in terms of cost, performance and desirability. Last year, I drove the SsangYong Korando SUV and was impressed. It delivered on promises in almost every area and sales success has reinforced that. Discovering that SsangYong is to release an almost entirely new Actyon Ute in April had me curious, as the local dealers were tripping over themselves to tell me how good it is. So excited, in fact, that even though it's not officially launched and won’t be until the printing presses are running for this edition of Farm Trader, they threw me the keys of a pre-production model and said, "Give it a good work out and tell us what you think." As a seasoned scribe I know that the best way to prove it is to drive it; I took them up on the offer. You can look at spec sheets and glossy photos and be enthused, but living with it and using it on the farm at home is what really convinces, or otherwise if all the dealer's talk is justified. So is it worth the hype? Let's put it this way: if you've driven or owned the previous version and formed a less than favourable opinion, you need to drive the latest model; if you've never driven one, you'll enjoy this; for the converted faithful, you'll be thrilled! Well almost everything is new, faster, quieter, more powerful or bigger. The only retention from the previous model is the four doors. Cosmetically, the SsangYong's polarising, almost scary looks – particularly at the front – are gone, replaced with a family-friendly face in line with other marques. Fitting a urethane-type valance to the front and lifting the ride height to 203mm has significantly improved an Achilles heel of the previous shape, giving it an off-road appeal. But that's not the whole story, for SsangYong has chosen to depart from the mainstream by fitting coil suspension all round and discs to all four wheels. It works on SUVs that regularly get dunked in water or mud, so the rational that this improves performance and is safer for braking convinced SsangYong that it would work. I tried the Actyon in the stream and found that the discs dry quickly, while losing little performance compared to a disc/drum set-up. On the open road, they are significantly more aggressive in their stopping ability, aided by the electronics (ABS ESP). This also helped to lift the tow rating to 2500kg braked, equivalent to the class best-seller. Deon Cooper, New Zealand GM for SsangYong, has promised me an example to drive with a towbar, so later I'll have a chance to check out how the Actyon handles loads that exceed its 1900kg mass. During the test, I had to pick up our family's ride-on mower. So with its 122mm (48") deck fitting easily between the wheel arches and the plastic liner shielding the tray from damage, it was all good to load. Andy from Waipara Garage in North Canterbury did the honours and loaded it. He knows a thing or two about mowers and vehicles and expressed his approval for the ability of the tray to swallow the mower. In fact, the tray is class leading: equal in width, but a little shorter, giving a squat appearance. Unloading was easy, too: just back the ute into a shallow ditch and drive the mower off. As it turned out, I bellied the Actyon with the front then rear wheels at some point, losing traction. 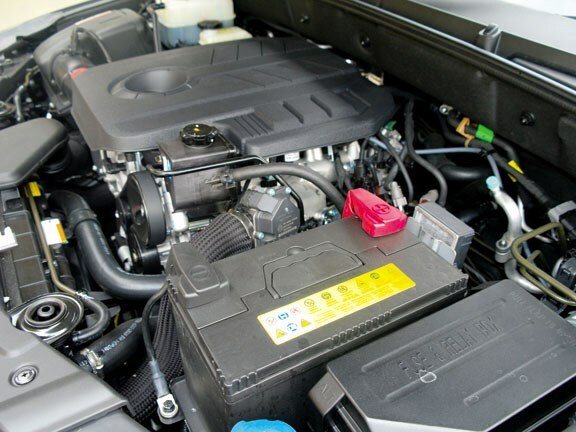 Easily accessed by the small rotary switch, which also engages low ratio, the ute changed to 4WD and pulled out, thanks to the smooth underpinnings that have the sump, drivetrain and exhaust well protected. For part of my test drive, I seriously challenged the vehicle on the farm, finding it equally as capable at most things, as the usual suspects are, finding only cross-axelling to be an issue. Normally, off-roading dictates that the ESP be switched off, although by some electronic trickery, leaving it on allows a measure of traction control that mimics a limited-slip diff and will extract the Actyon from some situations. It also works well in mud or long wet grass. Wheel articulation, thanks to the coils, is excellent at keeping the 16 or 18-inch alloys in contact with terra firma. If you need extra clearance, a 50mm kit is available from local dealers. We had one so equipped at the press launch and it does significantly improve its abilities. The super-quiet nature of the latest diesel leads the unwary into believing that it's petrol powered. The variable-vane turbo produces 190Nm at idle and brings in the 360 at 1800 revs. In practice, that means no turbo lag and a fast linear acceleration. Zero to one hundred comes up in 9.8 seconds in the manual and 10.1 in the auto. The firm though comfortable ride is characterised by little body role. The price to pay is at the top end, as performance drops off at 3600rpm, so holding lower gears is pointless. Surfing the torque curve, allowing the motor to drop revs in the same gear as a load comes on from a hill or presumably towing, demonstrates the best features of a modern commonrail diesel – the immense thrust at low revs. It's not neck snapping but it is easily capable of keeping up with traffic and dispatches the slower movers with alacrity. I drove both the manual and auto and found the auto to be the pick. The manual is marginally quicker, although it is vaguely irritating having to start it by depressing the clutch as you turn the key. 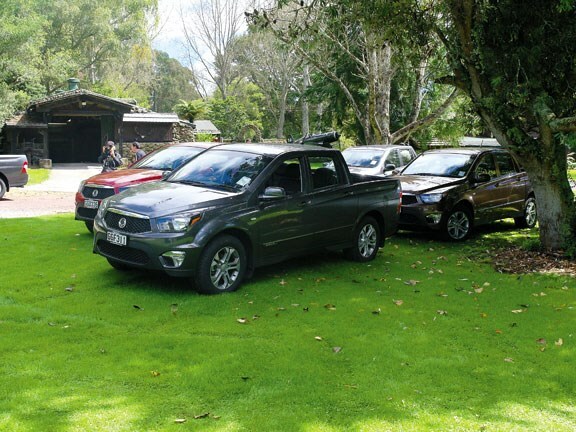 When the assembled motoring journalists arrived in Taupo for the mid March press briefing, they were in for a pleasant surprise. 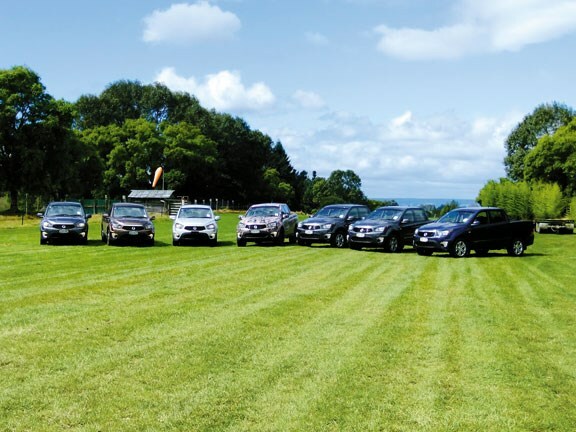 SsangYong had taken on legendary New Zealander Sir Colin Meads as its ambassador. He will be fronting an advertising campaign for the brand on TV and in print media. He now drives an Actyon and gives us his thoughts. In the slow, laconic manner for what he's known, he says, "Well I think it's a good truck. It fits me and the family – not all at once. My wife, Verna, likes it. I've been from Te Kuiti to Papamoa and back a couple of times, and now I'm here in Taupo and it's still got more than a quarter of a tank." We dined out with Sir Colin that night and I had the pleasure of sitting next to him. Surprisingly, we didn't mention rugby all evening; Colin was more interested in cars, farming and where we all came from. A mark of the man came when someone brazenly asked if SsangYong was paying him. "No," he said. "I want to help junior rugby in the King Country so I've asked them to sponsor that. They hope to sell 400 utes this year, so I'd like it to help my province which gave so much to me." The Actyon is packed (or should that be action-packed) with nice touches. The ute has a choice across both the two and four-wheel drive of six-speed auto or manual transmissions. Twin air bags ABS, EBD, ESP and two isofix points head up the safety list. 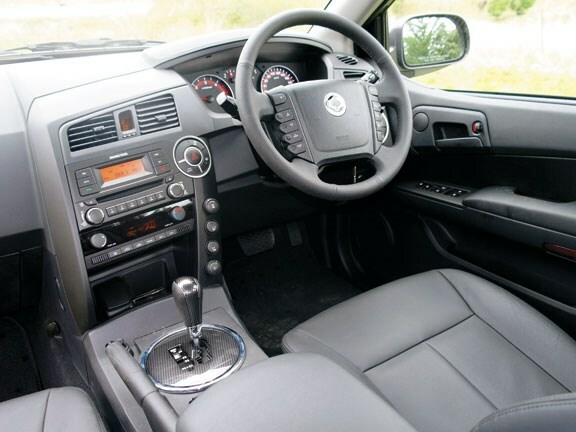 Steering wheel controls for Bluetooth and a CD/MP3/USB, AM/FM stereo (with six speakers), along with the simplest ONE-touch cruise controls, fall easily to hand on the leather-covered wheel. Other nice touches abound, with heated seats in all models and leather in the SPR, which also has electric adjustment for driver and passenger. A trip computer, with travel, distance, fuel use and remaining, is visible from the central dash in front of the driver. Air-conditioning, climate on the top spec and reversing sensors, as well as electric windows on all doors, which wind down flush with the door, are standard in all models. The mirrors are electric and large, though not folding, and rain-sensing wipers and auto headlamps, as well as a headlamp adjustment, reveals SsangYong's close attention to detail. This ute will be SsangYong's biggest selling model, at least until the new Rexton breaks cover later this year. I believe the stated goal of 400 is conservative as this it is the "real deal," showing that the Koreans are fighting for their place in the competitive double-cab ute market. They now have one of the best priced products in the market to match their competitors in most areas, exceeding in others, at a significantly lower price.